Are looking for a piece of paradise with a smaller footprint? 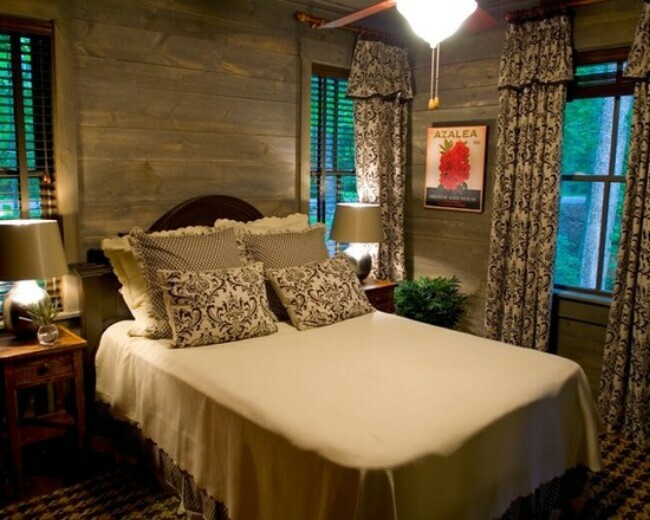 Then you have to check out the Camp Callaway Cottage! This 1,091 square foot home is stunning! With two bedrooms, a full bathroom, living room, dining room, kitchen and two porches, it has everything you need to relax and enjoy life. 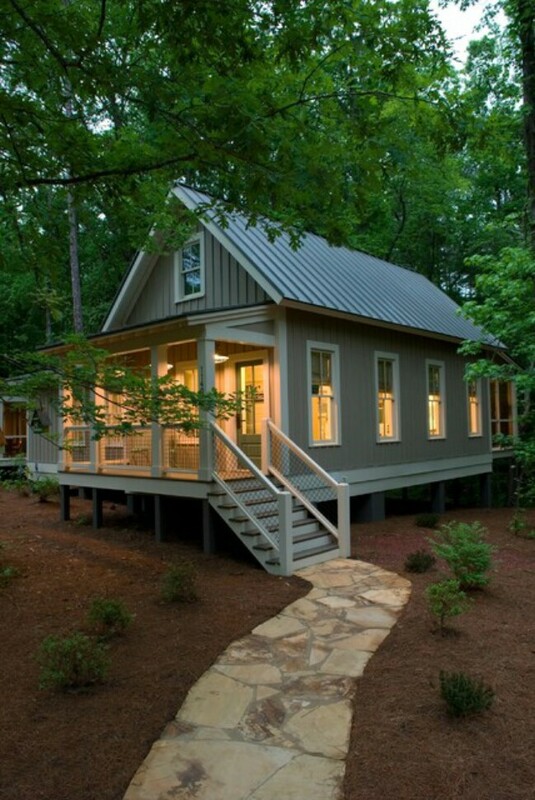 This small home was built by Pine Mountain Builders out of Georgia. They’re certified by the EarthCraft House which means this home is very environmentally friendly, energy-efficient, and low-maintenance. All the things we love about small homes! Take a look at this living room! We’re drooling. 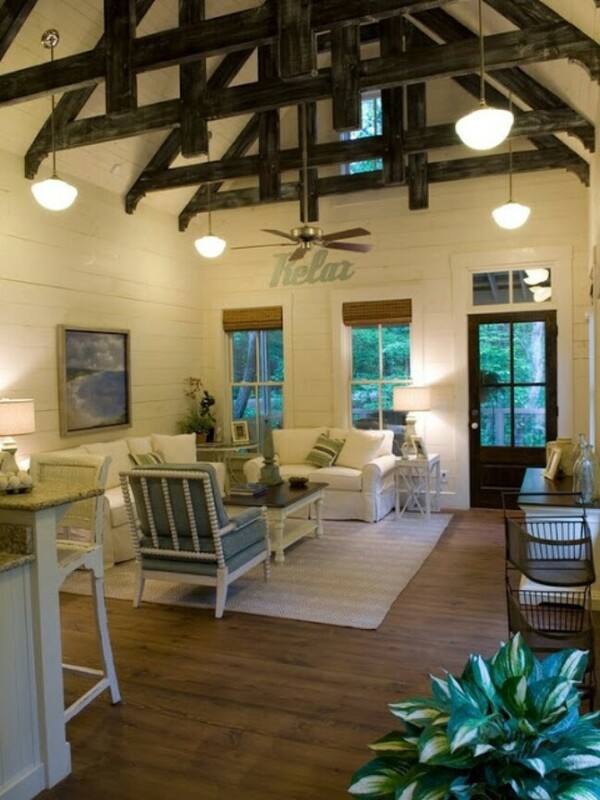 The shiplap walls and exposed beams give it a rustic feeling which is complimented by the old school hanging lights. We love the wall of windows to make it feel open and airy. Look at this gorgeous room! From the shiplap to the furnishings, what’s not to love? 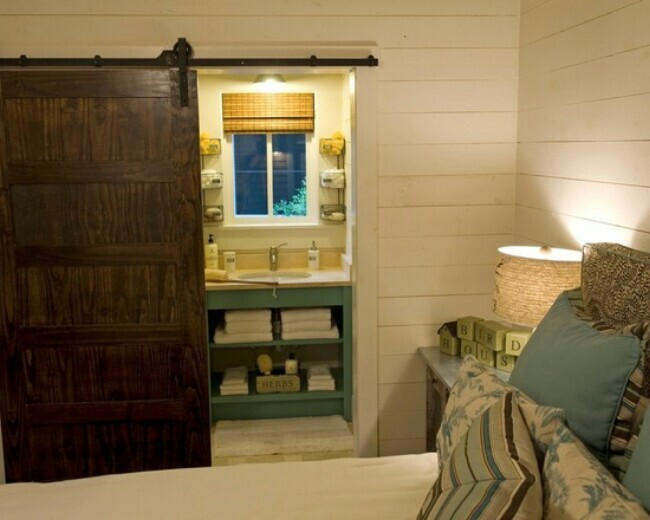 Attached to this room, is an adjoining bathroom that you get to through an awesome sliding barn door. And don’t you love the color of that vanity? 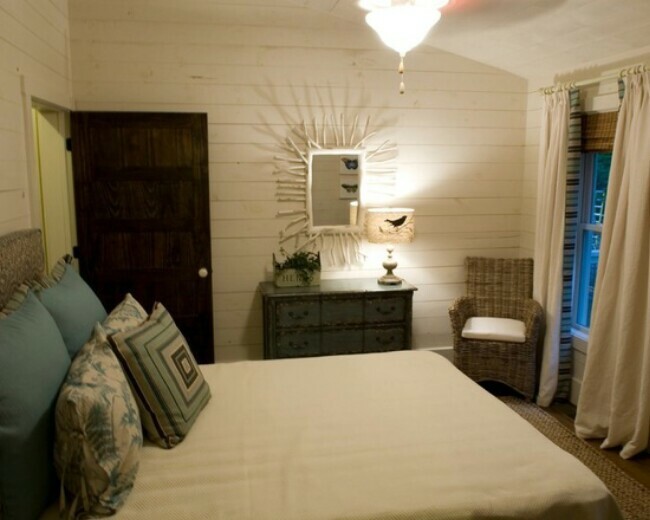 The other bedroom features darker shiplap walls and plenty of windows. 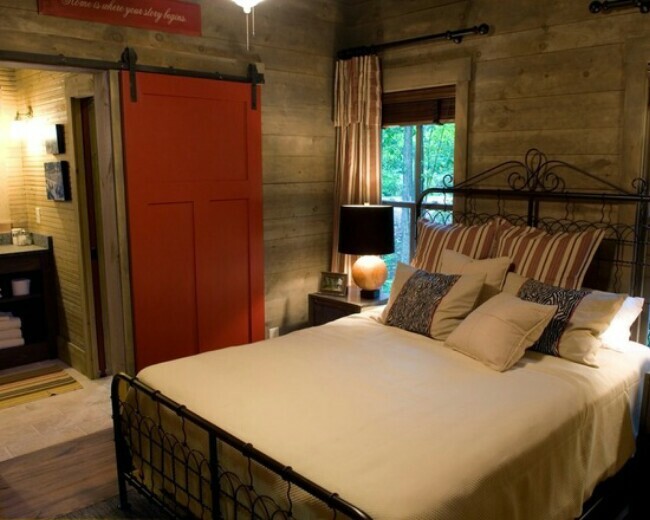 It also has its own bathroom behind the sliding red barn door. The master bathroom is even more dreamy with a claw foot tub nestled between the two separate vanities with open storage and medicine cabinets. 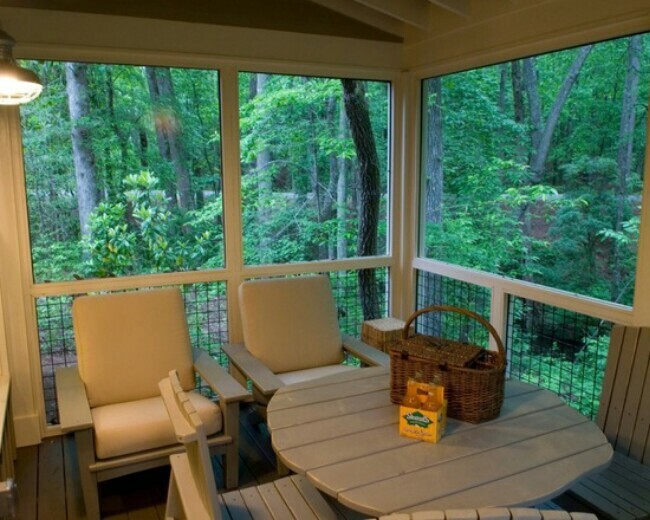 This is one of the porches and it’s completely screened in to let you enjoy being outdoors without all of the annoying bugs and intruders. 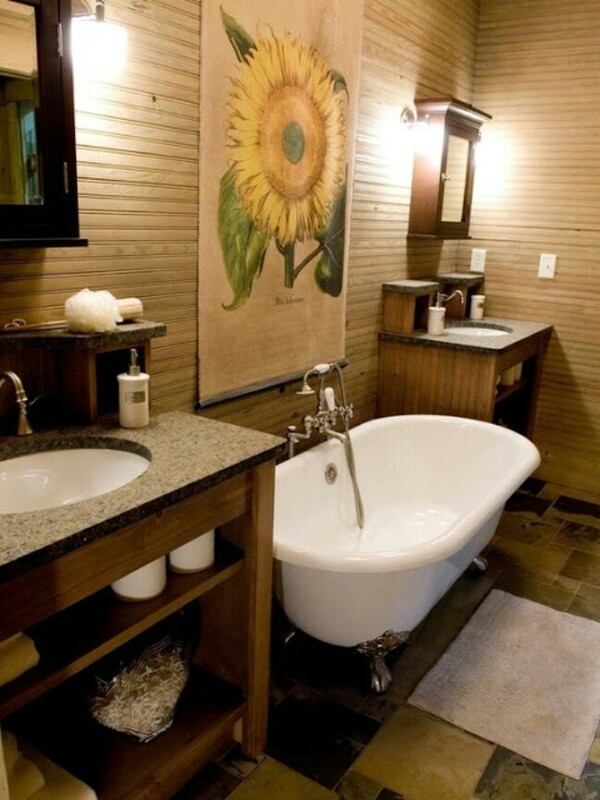 The full bath features a double vanity with open storage underneath. 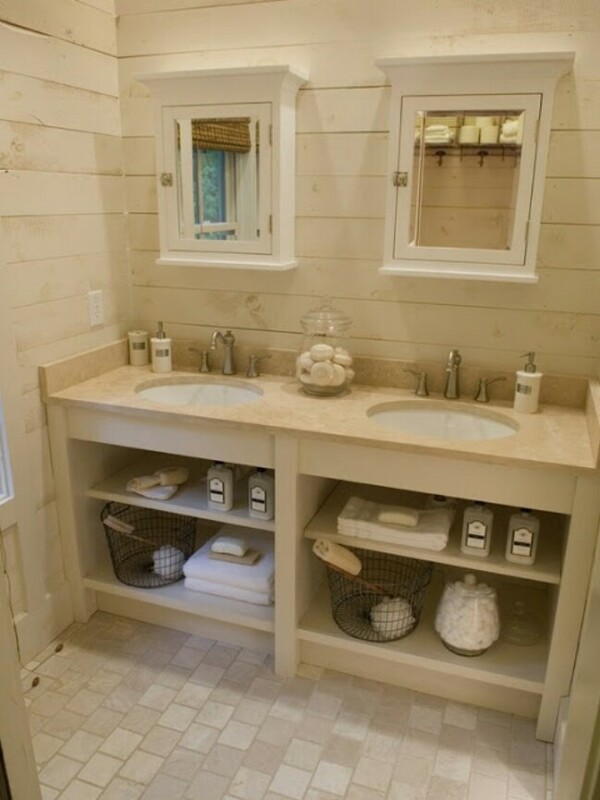 The medicine cabinets give extra storage and a place to keep things out of sight. 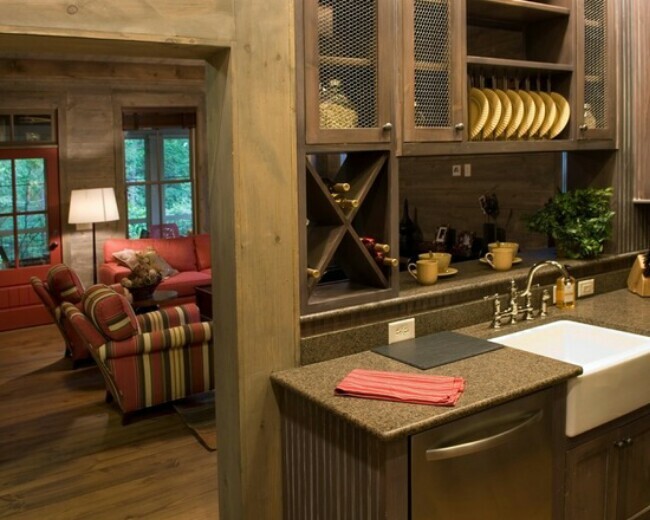 The kitchen and wet bar area leads into the den and has a pass-through window above the farmhouse sink. 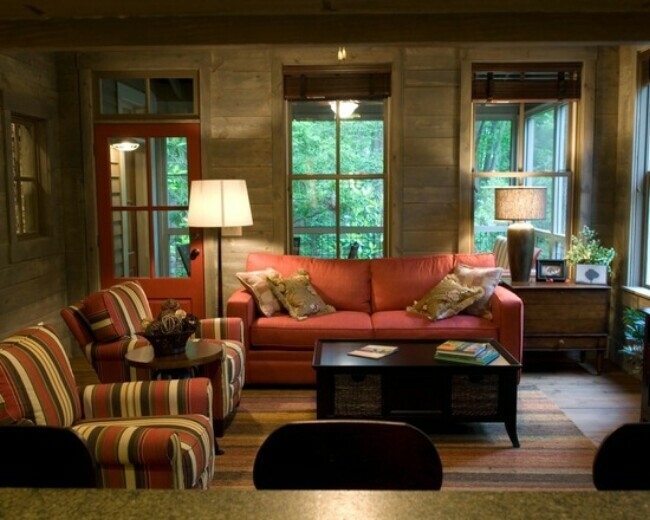 This living area features even more windows and darker shiplap for a more masculine feel. 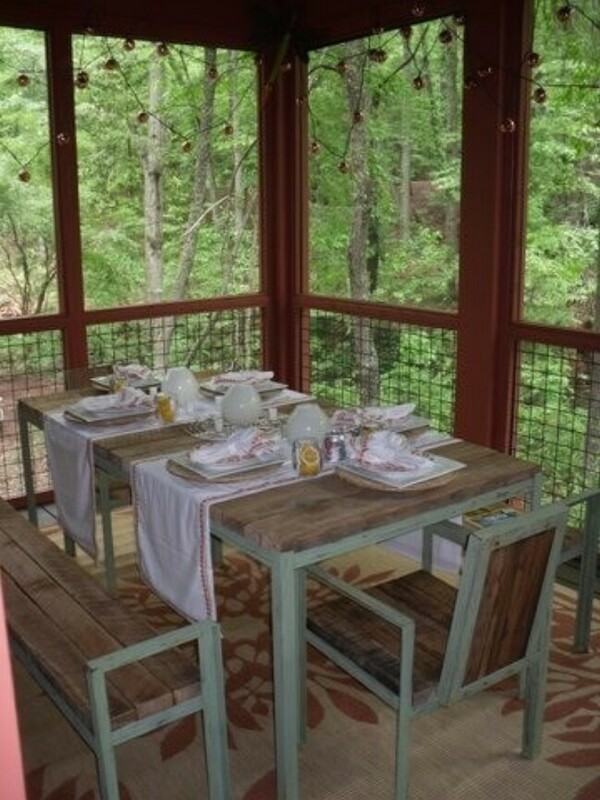 Here is the other screened porch furnished with a dining table so you can eat while enjoying the outdoors under the twinkling string lights. 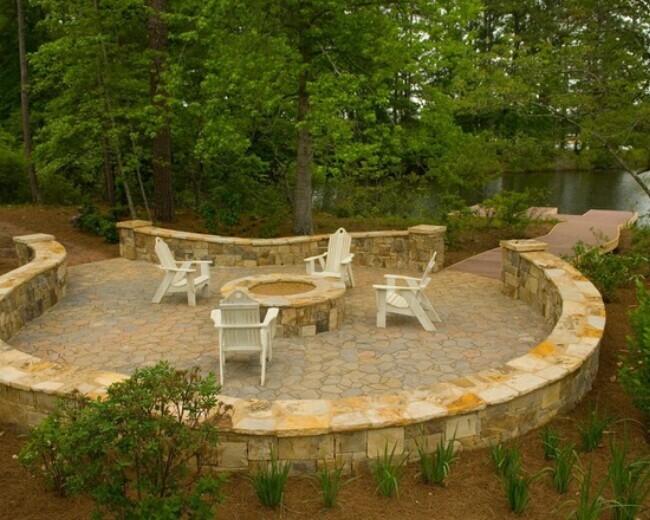 In case you start to feel cramped inside the house, you can gather around the outdoor fire pit on the stone patio which leads to the nearby creek. It doesn’t get better than that! 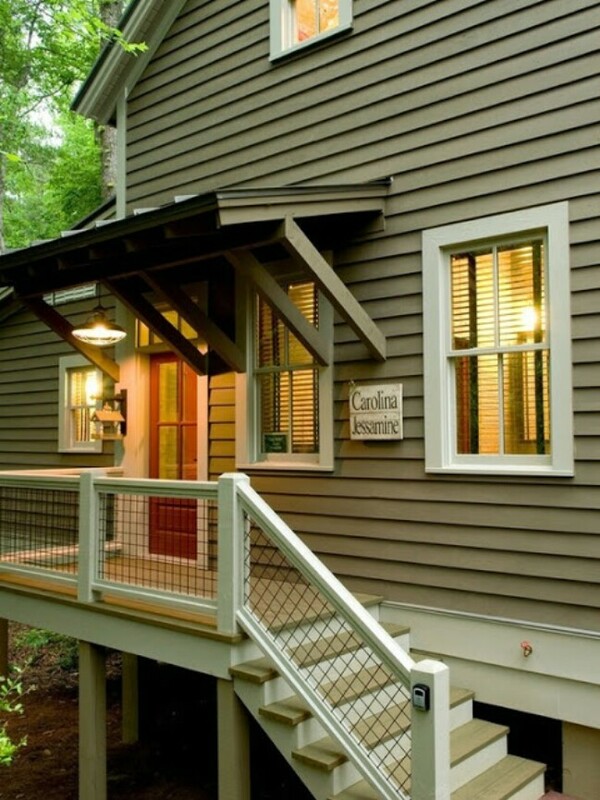 This gorgeous home truly has everything we could dream of wanting in a perfect small home. No detail is missed and you can see the quality with just a glance! Yes I was wondering how much this cottage cost to build? It is beautiful! I would like some floor plans on your camp Callaway Cottage and some kind of cost if a person had their own land. I would love to see the floor plan for this tiny house. I count 3 full baths but the description says one ? Do you know where I could get the blueprints to to build this? This is gorgeous! I am also wondering about cost to build. How does this work? I keep going back to this cottage. What a house. So perfect! How would I go about getting building plans so I could build one in Washington? Is this for sale? I am also interested in the floor plan, sq ft, bdrm/bath count, etc. In LOVE with this! This would be perfect for us. Being disabled, I’m forced to be picky in choosing designs. The way these two levels are set up with exterior entrances, it’s perfect!!! How can we find out about costs and blueprints? Hello, How much is the Camp Callaway Cottage ? Do you build and deliver, or have the plans for sale? Bottom cost? Does it have a laundry room? Can you make tub to a shower? Would love to see a floor plan…Does anyone answer these posts ? I have called and written a number of times ….Nothing! Watch the you tube video and hit pause when the plans appear. You can zoom in and look at the floor plan there. This would make a lovely in-law suite. I am very interested in getting more info. and seeing a floor plan. 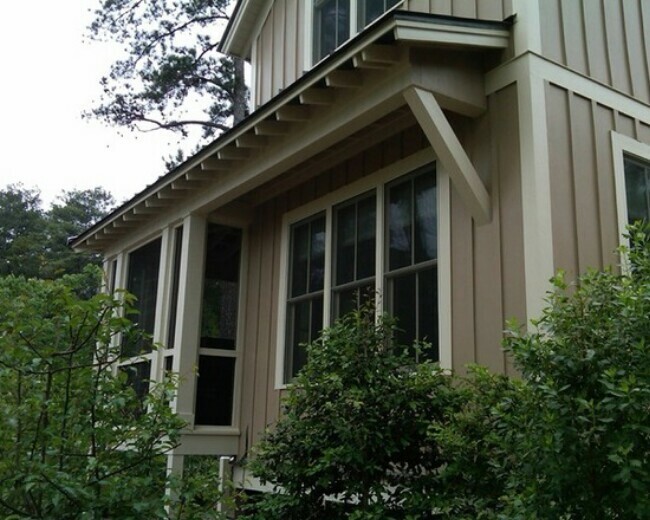 Pine mountain builders llc are the builders of this cottage, they have a website and a way to get a hold of them. This is listed as a custom build. I went to the video and the plans stated a price of $339,900. Why have you omitted two key pieces of information when you could have easily anticipated both: typical building costs and floor plan? Im a single mother to a 2yr old, I dont have much help from her dad and I work my behind off and still can’t afford these high priced apts in my area. I would love to have a tiny home for me and her but I dont own any property either. You’re homes on here are gorgeous, I can only wish to have something like this one day for me and her. Keep up the good work you guys!